Pomham Rocks is a stark islet of approximately one-half acre rising out of the Providence River, about 800 feet from the east shore in the Riverside section of East Providence. The name, sometimes spelled "Pumham" in early records, is after a Narragansett Indian sachem who was killed in King Phillip's War in 1676. Some locals will tell you it's pronounced with equal emphasis on both syllables-"POM-HAM" rather than "POM-um." With increased shipping traffic heading toward Providence, Pomham Rocks was an obvious place to establish a navigational aid. A pyramidal daymark was erected around 1828, but something more was needed to help ensure the safety of the parade of vessels that passed day and night. Congress granted an appropriation of $20,000 on July 15, 1870, for three lights on the river-at Pomham Rocks, Sassafras Point, and Fuller Rock. A wooden dwelling with a mansard roof was built on a granite foundation, 28 by 28 feet, with a hexagonal lighthouse tower mounted on the front center of the building. The lighthouse was first lighted on December 1, 1871, with a sixth-order Fresnel lens (later upgraded to fourth-order) showing a fixed white light. On October 1, 1872, the characteristic was changed to fixed red. The first keeper, C. H. Salisbury, had a long 22-year stay. The Providence Journal reported in 1891 that the "lovely house" included a parlor with a piano and a hall containing a large library. A flower and vegetable garden was maintained by the Salisburys, who lived at the lighthouse with their daughter and a dog named Sailor. Salisbury remained keeper until his death in 1893, when his wife, Mary, took over for a few months. It was often difficult to reach the mainland from the lighthouse, especially in mild winters when a path for a boat had to be cut through the thin ice. In colder winters it was easy to walk across the ice to the lighthouse. A fog siren was installed at Pomham Rocks in 1900. One newspaper called the new signal, "The Greatest Nuisance in the State." As complaints from local residents mounted, the continuous horn was soon changed to a three-second blast at 12-second intervals. The siren was replaced by a fog bell in 1903. Adolph Herman Aronson was keeper for a 29-year stretch beginning in 1908. Aronson was a native of Sweden who came to America in 1890, when he was 18. He worked on vessels traveling to foreign ports until he joined the Lighthouse Service in 1899. After service on the Hog Island Shoal Lightship and the lighthouse that replaced it, he went to Pomham Rocks with his wife, Nellie (Johnson), and their three children, Marjorie, Raymond, and Elmer. According to an article in the Providence Evening Bulletin, the Aronsons brought their furniture to Pomham Rocks in small boats a little at a time. Their piano was transported on a two-masted schooner, swung between the masts. When the schooner reached the island, the crew all moved to one side, causing the vessel to tilt, and the piano was lowered gently to the rocks. A feline member of the family named Tommy 3rd landed the Aronsons in newspapers around the country. "Fish Catching Cat is Self-Supporting," read one headline. Tommy the tabby would perch on the edge of the island watching for unsuspecting fish, waiting for the right moment to dive in and catch them. Sometimes only the tip of Tommy's tail could be seen above the surface as he did his work. He'd pile up the small fish under a lilac bush until satisfied he had enough for a meal. 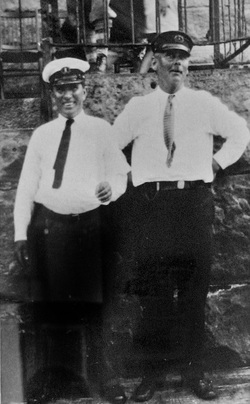 Left: Charles Whitford (left), keeper of Sabin Point Light, with Adolph Aronson, keeper at Pomham Rocks. Courtesy Beavertail Lighthouse Museum Association. Tommy had been brought to Pomham Rocks as a kitten by the keeper's son, Raymond, who found him on the street in Riverside. His pursuit of fish had its hazards; twice Keeper Aronson had to remove fishhooks from Tommy's mouth. By the time he achieved celebrity status in the early 1930s, Tommy had lived on the island for a decade. By then, the rest of the family was spending most of the winter months ashore, often leaving the keeper and Tommy alone at the light station. 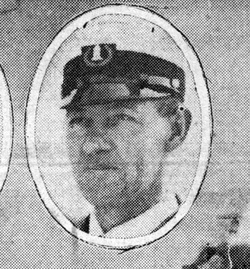 Adolph Aronson retired from lighthouse keeping in 1937. The next keeper was William J. Howard. Howard was the son and brother of lightkeepers, and he had gained fame along with his brother George for saving lives near Wing's Neck Light on Cape Cod. While at Pomham Rocks he once saved four men in a motor boat who were drifting toward some rocks. Keeper Howard passed the time at what he called "Little Alcatraz" by carving model ships and playing guitar. When he retired, Keeper Howard said he was glad to leave for three reasons -- the lighthouse had no electricity, running water or bathtub. Pomham Rocks never did get running water. A large cistern collected rainwater for the use of the keeper and his family. The station got a telephone in 1940 and finally received electricity in the late 1950s. Before that the refrigerator and stove ran on kerosene and a windmill supplied power for a radio. One of the last civilian keepers was Howard B. Beebe in the early 1950s. A veteran of almost 30 years of lighthouse keeping, he lived at the lighthouse with his wife and three of their five children. A native of New London, Connecticut, Beebe had previously been at New London Ledge Light, Block Island North Light and Portland Head Light. Beebe arrived at Pomham Rocks on October 2, 1951, with his wife and four of their five children, along with a spaniel named Roger and two rabbits. The station by this time had a telephone, added in 1940, and the boat had an outboard motor that cut the trip to shore to about a minute in good conditions. That made getting two of the children ashore for school each day a bit easier. According to an article in the Providence Journal, Keeper Beebe had to observe and record the weather every four hours, day and night. He had no trouble keeping the schedule, thanks to Francine, the youngest in the family. "The baby is our alarm clock," said the keeper. "One of us is always awake." During its last years as an active aid to navigation, the lighthouse was staffed by two Coast Guard keepers, who alternated three days on the island and three days off. The last crews also had the company of two dogs, Jennifer and Pooch-Pooch, who helped keep the rats away from the small island. Pomham Rocks' original Fresnel lens was replaced by a fourth order lens in 1939. This lens was removed in 1974 and is now on display at the Custom House Maritime Museum in Newburyport, Massachusetts. The lighthouse was discontinued in 1974 and was replaced by an automatic light on a skeleton tower. When they learned it was to be decomissioned, the Rhode Island Historical Society stepped in and took temporary possession of the lighthouse. In 1980 the General Services Administration sold the property to the Mobil Oil Company, which has a large refinery and terminal near the lighthouse, for a winning bid of $40,100. Mobil stated that they wanted to "preserve the continuity of the waterfront area." Bob and Susan Charbonneau were the first caretakers. In 1976, 26-year-old Stephen Allen became the new caretaker. Allen was the brother of Susan Charbonneau, and their brother, Chris, also helped out on occasion. Stephen worked during the day at his father's boatyard and returned to the lighthouse each evening. Allen enjoyed his solitary hours on the island. "It gets me away from everything," he said, "but not too far away. . . . And it's a weird place to be in a storm." In recent years there has been no caretaker on the island. ExxonMobil leased the historic structure at no cost to the American Lighthouse Foundation. At a meeting in early 2005 in East Providence, a new chapter of the American Lighthouse Foundation, the Friends of Pomham Rocks Lighthouse (FPRL), was announced. At that meeting, Greg DeMarco, superintendent of ExxonMobil's East Providence terminal, presented $25,000 to the American Lighthouse Foundation toward the restoration of the lighthouse. The hard work of the Friends soon paid big dividends. On June 6, 2005, a group of representatives of the American Lighthouse Foundation, the Friends of Pomham Rocks Lighthouse, the Coast Guard, and Exxon-Mobil gathered on the small rocky island for a flag-raising ceremony. As part of the event, ALF and the chapter awarded a contract to Keith Lescarbeau of Abcore Restoration, who performed the miraculous restoration of Rhode Island's Plum Beach Light in 2003. A restoration of the exterior of the lighthouse was completed in early 2006. On July 30, 2006, the navigational light was returned to the lighthouse. In the spring of 2010, Exxon Mobil donated the lighthouse to the American Lighthouse Foundation. A private ceremony for the official transfer was held on April 17, 2010. In January of 2016, The Rhode Island Historical Preservation and Heritage Commission awarded $150,000 to FPRL to help with the restoration with the lighthouse's interior. Recent work has included the construction of new docking facilities, restoration of the oil house, installation of new fencing, and restoration of the lighthouse windows. In early 2017, after 37 years, electricity was restored. With it came heat, which will prevent the further deterioration of the interior. FPRL is now seeking funds to complete the final stages of the restoration of the lighthouse, which will culminate with the opening the lighthouse to the public. Your donations are graciously appreciated. Pomham Rocks Light can be easily viewed from the 14.5 mile long East Bay Bicycle Path that borders the Providence River. The path is open to walkers as well as bikers. Call (401) 253-7482 for more information on the bike path.